My name is Jo Sparks. I am an acoustic guitarist who has worked in the care sector for over 20 years. I now use my creative and entertainment skills to run Music Activity and Arts & Crafts sessions for people of all ages and abilities. Over the past 8 years I have focused on the specific needs of older people and those affected by dementia. With the help of local care-providers I have developed a varied programme of activity sessions particularly suited to these individuals. 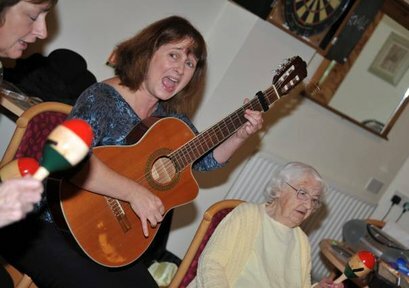 My Music Activity sessions are a great mix of gentle exercise, seated dance and singing and I have a wide selection of props such as a parachute, brightly coloured scarves, toe-tappers and percussion instruments all of which help to keep the sessions fresh and fun. The Arts & Crafts programme now covers a huge range of projects, all of which have been tried and tested! There is something for everyone and for every occasion. Just look at the photos around this site! Recent favourites include pottery making, paper flowers, tortoise trinket-pots, chalk-boards, lanterns, pop-up cards, coasters, Christmas decorations and Easter baskets. All sessions are carefully planned so that everyone can join in regardless of their physical needs, mobility, memory or cognitive impairment. 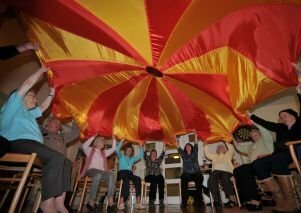 Engaging, interactive and stimulating, these sessions get people laughing, talking, singing and moving.